Imagine Art School - Painting Lessons, Art Workshops, Social Painting, Fun and Relaxing Learning. JOIN US! For a great way to relax, paint and socialize. All supplies (paints, brushes, canvas and pre-sketched detailed drawing of your pet) are included in these fun step by step creative workshops! As we have limited spaces (only 9 for this class) available please book early to reserve your spot. 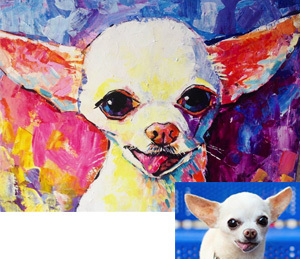 In this workshop we will be painting YOUR OWN PET! STEP 1: 10 days before the event (or earlier) we ask that you book this event and afterwards send us 2 or 3 photos of your pet - (can be cat, dog, bunny, etc... it also doesn't have to be your own pet - perfect gift for someone!) via email to imagineartparty@gmail.com As we will be painting the portrait (only face, not body) please have all photos be of the animal's face. STEP 2: We will do a detailed pencil drawing on 20x16 canvas of the portrait of your pet. STEP 3: When you arrive on the day of the event the pre-drawn canvas will be waiting for you to paint on! We will instruct you each step of the way and the results will be amazing! Also please check out our previous Paint Your Pet Workshops here.